If you have finally decided to exclusively date someone, then congratulations! You’re on your way now to know if that person is really meant for you. However, if both of you are just dating for a month now, you should be careful on jumping into a bigger picture because your date might think that you’re just an easy person who makes rash decisions. 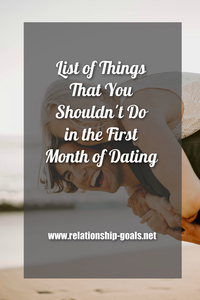 So before you get too excited about what’s going on between the two of you, it is much better if you will take this moment to learn what are the things that you shouldn’t do in the first month of dating. 1. Dropping the LOVE bomb. Yes, I know how excited and in-love you are, but this is not the right time to drop the love word to your date because you have to take things slowly to avoid overwhelming your date. Also, if you will let your date know that you already love him/her, you are putting yourself at a big risk since you still don’t know how he/she handles a relationship. That means, before dropping any love bomb to your date, it is more appropriate if you will just ensure that both of you are on the same page before moving anything in a much higher level. Know him/her first because this will help you if he/she deserves your heart. 2. Making plans for the future. Never make advance plans for the future when you are just in the first month of dating such as talking about your wedding plans, having kids, and whatnot. Instead of making plans for the future, it is much better if you talk about your hobbies, sports, or what you do in your job because this will help in establishing your connection with each other. 3. Talking about your ex-BF/GF. Never ever make your ex-BF/GF a topic if you are just dating for a month because you are giving him/her an idea that you are not yet done with your past relationship. Plus, he/she might think that you are just using him/her as a way to move on from your bitter feelings to your ex. 4. Buying the same stuff together. Keep every purchase in separate if you’re just in the first month of dating. Don’t allow him/her to pay for your dinner, drinks, or whatever it may be to avoid giving him/her a commitment to your dating relationship. Also, this is not the right time to buy the same pair of shoes, clothes, dog, or whatnot because you’re just dating each other and not yet in a serious relationship. 5. Introduce him/her to your friends and family. Before you let your date meet your entire family and friends, you have to make sure that you already have a mutual understanding. In other words, if you are just in the first month of dating, don’t get too excited in introducing him/her to your loved ones because this is only meant for those who are already in a relationship or in a long-term connection. All in all, take everything easy and calm. Take this opportunity to know each other well first because you don’t even know if he/she is the right person for you. Just enjoy each company without any pressure or serious commitment.